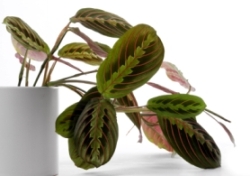 Prayer Plant earned its name because of the way its leaves fold together at night, like hands closed in prayer. Its leaves unfold in the morning light, sometimes making a rustling sound. Cool, huh? Showy, oval-shaped leaves have a spectacular light-and-dark-green feathered pattern with red veins, and are often red underneath. Its leaves grow to about 5 in (12 cm) long. 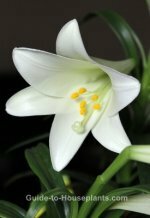 Prayer plants rarely bloom indoors, but sometimes grow tiny, white tubular flowers on long stems. The flowers are insignificant, anyway. It's the magnificent leaves that are really the attraction. There are a few named varieties. One of the most popular is 'Erythroneura', pictured here. It's sometimes called herringbone plant because of the pattern of its prominant red leaf veins and dark-green and yellow-green leaves. You may find it for sale as 'Tricolor'. 'Massangeana' is also striking with black-green leaves and silver veins. Give it a rest. You can expect your plant to take a "rest" in winter and growth will slow down. Water lightly during this time and stop fertilizing, but maintain humidity. You'll see a flush of colorful, new leaves appear in spring and summer. Prune it. Your plant will benefit from occasional pruning, which helps to give it a nice shape and promote new growth. Fall is the best time to cut it back. Use sharp pruners to cut away some of the older leaves. Give it good care and it will live for many years. This tropical plant prefers a warm, humid environment and well-aerated soil. To prevent the soil from becoming too compact, repot it every spring. Do not pack the soil tightly around the roots -- keep it loose. You can choose a shallow pot for your prayer plant. Its shallow root system doesn't need much room. Watch for spider mites. Dry indoor air in the winter months encourages these pests to invade house plants, another reason to keep the humidity up. You'll first notice webbing between stems and on the undersides of leaves. Clean leaves. Gently wipe leaves with a soft, dry cloth to keep them dust-free. Light: Prayer plants grow best with bright, indirect light from an east- or north-facing window. It also grows well under fluorescent light. Keep plant out of direct sun; strong sunlight will cause the leaves to fade. Water: Keep soil evenly moist spring through summer, slightly drier in winter. Humidity: Requires moist air. Brown leaf tips are a sign that the air is too dry. Try to maintain at least 50% relative humidity year-round. It's a good idea to use a humidity tray or a room humidifier. Fertilizer: Feed with a liquid fertilizer diluted by half every 2 weeks spring through fall. Propagation: In spring, take 4-inch (10 cm) stem cuttings with 3-4 leaves attached. Root them in moist potting mix. When your plant gets too big, you can easily divide it in half by pulling apart its shallow roots.